The Laticrete Hydro Ban Flange Drain and the Laticrete Hydro Ban Flange Tile Drain are low profile floor drains specifically for bonded waterproofing installations with Laticrete Hydro Ban waterproofing membrane. The Laticrete Hydro Ban Linear Drain is a low profile linear floor drain specifically designed for bonded waterproofing installations with Laticrete Hydro Ban waterproofing membrane. Laticrete Hydro Ban Drain Grate, 5" x 5"
Schluter-KERDI-DRAIN is a floor drain specifically designed to allow connections to Schluter®-KERDI or other load-bearing, bonded waterproof membranes. Schluter®-KERDI-LINE is an elegant, low profile linear floor drain specifically designed for bonded waterproofing assemblies in showers, steam rooms, wet rooms, and other applications that require waterproofing and drainage. Covering support D is a stainless steel plate with Schluter-KERDI laminated on the surface to allow for bonding of ceramic or stone tile which creates a virtually invisible drainage line. Grate Option B is a brushed stainless grate with perforated design for use with Schluter Kerdi-Line Linear Drains. Grate Option A is a brushed stainless grate with closed design for use with Schluter Kerdi-Line Linear Drains. The universal design of the USG Durock Shower System drain assembly simplifies installation, and accepts both 4" and 5" USG Durock Shower System exclusive Designer and Pro Series grates. The Schluter Kerdi Drain adapter kit is utilized to adapt, rather than remove, traditional clamping ring drains to bonded waterproofing applications. The Ebbe America E4400 Riser serves as the central hub for all Ebbe America grates. It’s square shape means only easy straight cuts are needed - no difficult circle cuts. This unit is a complete drain assembly (excluding grate). It includes the drain riser, temporary construction plug, hair trap and 2 piece clamp collar. The Ebbe Pro series is made with a stainless steel clad over a polycarbonate base giving it strength and durability. Ebbe’s INNI Linear Drain can be placed anywhere in a shower as it is easily customized to fit any shower space or size for either residential or commercial installations. New for March 2019! 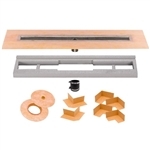 The Schluter Drain Grate Kits work in conjunction with Schluter Kerdi-Drain Flange Kits along with Schluter Kerdi Shower kits to provide the drain grates. New for March 2019! Schluter-KERDI-DRAIN is a floor drain specifically designed to allow connections to Schluter-KERDI or other load-bearing, bonded waterproof membranes. Schluter-KERDI-LINE is a low profile linear floor drain specifically designed for bonded waterproofing assemblies. Schluter-KERDI-LINE is a low profile linear floor drain specifically designed for bonded waterproofing assemblies. The tilable covering support is placed flush with the top of the channel body and can therefore accommodate any thickness tile covering.